A few months ago as the summer was leaning into fall my coworker, Jessica, and I walked back from the park where we ate our lunch. 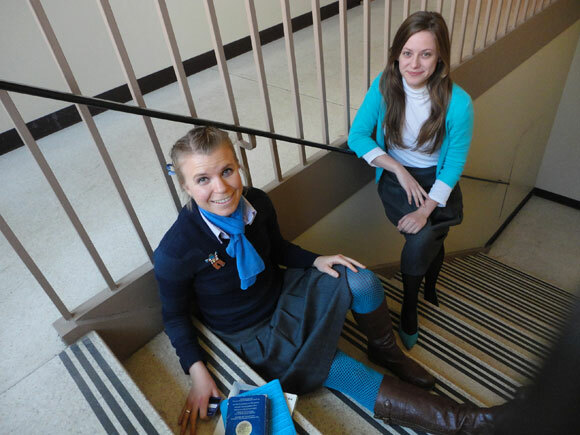 The sun was on our faces and in our steps as we decided to wear cyan the next Friday. Only Jessica forgot and I was the one who ended up meeting a friend for lunch in cyan fishnets. It’s the epitome of professionalism, I know. A few weeks ago Jessica emailed me. It should be noted that we work approximately fifteen steps from each other. That is no match for modern forms of communication! “We should meet for lunch,” was the message. So then we decided to hammer out the crucial details. Where: Mexican. But we changed our minds to Thai. What: I said we should talk about Christmas stuff, and Jessica thought it was funny that I would want to settle our topics beforehand. Why not? : So we decided there would be a color theme as well, and we went with cyan. And we both remembered! Cyan clothing! They were Jessica’s Nana’s shoes first, but then Nana started having foot issues and she gave them to Jessica a few years back. The only problem was that, as she wore them today, they were practically dry rotting off of her feet. “I think this will be their last day,” she said, posing with Mary-Poppins’ feet. Also from my coworker’s bag-o-scarves! Seriously, guys, I haven’t even worn all of the scarves contained therein! So many scarves. Is super cute. So cute it deserves its own blog post. 🙂 Ha! Stay posted. I actually forgot to ask where she bought this, so I’ll make it up. The period to which this sweater harkens was when she was still attending University but had the summers off. As a favor to our government, she went on an undercover mission to the Carribean where she saved a foreign (and handsome) diplomat from harm using a combonation of street smarts, scissor-weilding skills, and her mad lizard-strecthing yoga. The government honored her at a banquet off of the sea where said-diplomat toasted warmly as the attending guests applauded and the candles sparkled. The next day she woke up late and wandered down to a local market where native people sold freshly caught fish, handiworks, and used trinkets and antiques. She meandered through the stalls, wondering about this diplomat and whether she should stay in this tropical paradise with him forever… when she came across this sweater. It was fuctional, warm, and it fit so well. It reminded her of a boy back home. (*coughDancough*) She realized: she didn’t need the glamour of a foreign beau. She just needed someone who cared for her, listened to her, and loved her. On cold winter days she looks out her office window and the color of her cardigan reminds her of warm tropical nights and the breezes off of the ocean. When I was in high school Christine and I found an assortment of colored fishnet stockings at the local dollar store. So we did what any sensible high schooler would do and bought every single color: purple, cyan, and hot pink fishnets. I can’t say I’ve worn them frequently…but I have definitely worn them. They bring the party. Yep! Cyan Tuesday. Oh, and our Thai food was awesome and led to food-induced comas in the afternoon. Nom nom nom! As a side note of sorts, I’m thinking about throwing some different features in the upcoming months for “What I Wore Wednesday.” I have two thoughts…the first is me asking friends-around-town who rock unique styles to share about their clothes and experiences. The second thought is that maybe I’ll set a color for a day (like today’s was “cyan”) and accept your photo submissions of what YOU wore on a given Wednesday. Te gusta? Let me know what you think in the comments! I wore a lilac oxford shirt, a navy sweater, a cyan scarf, grey wool skirt, cyan fishnets over navy tights (have you ever tried to wear fishnets straight?? They squeeze around your toes!) and brown boots. 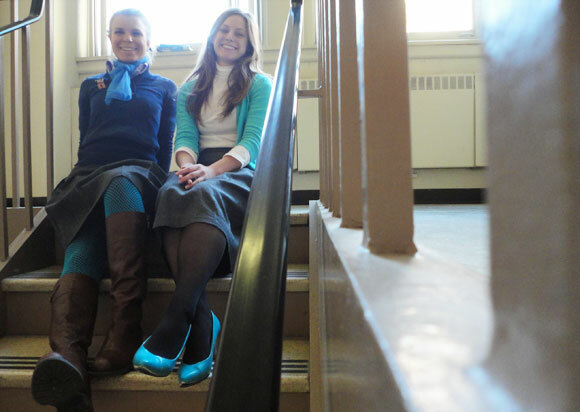 Jessica wore a white shirt, her cyan cardigan, a grey skirt, dark tights, and the CYAN SHOES! Dude I would send in some mad cute teacher outfits!